Pinterest is a WONDERFUL tool. 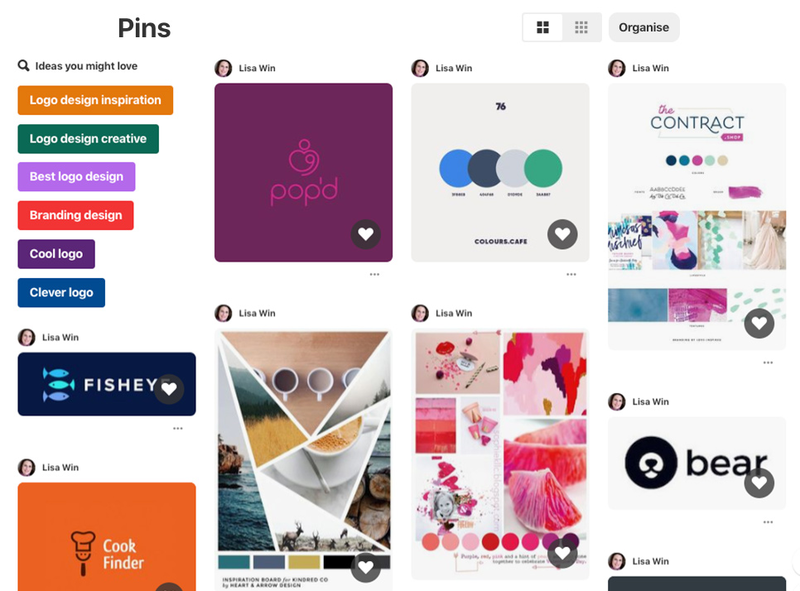 As a designer I often ask my clients to create a Pinterest Board - especially if we are creating a new brand or are working together for the first time! I like to describe it as Google Images on steroids. It’s honestly an amazing tool for collating ideas and inspiration all in one place. 1. To help me get an idea of the styles they love and what they are aesthetically drawn to. 2. To help them to begin to flesh out their ideas and thoughts. and 3. To Understand what is in my clients mind (not completely of course!) #mindreader. I often find that if the client commits to this process that I begin begin to see patterns that they might not notice. Patterns of ideas they like, concepts they’re drawn to and styles that will suit them. My clients don’t always know what they want in their design, but this process helps us both to take a step closer. This will often save hours in the creation process as they’ve given me the chance to take a glimpse into their subconscious and what it might be expecting out of their design. Below is an example of three COMPLETELY different Pinterest boards I’ve been given. As you can see, there are so many different directions you could go with a design and while I take into consideration many other things when designing a brand (like target audience, business purpose and design styles) there is still so much room for movement that differs between each client and their personal style…and after all, they often know their target audience better than I do!! So, let’s get into it! 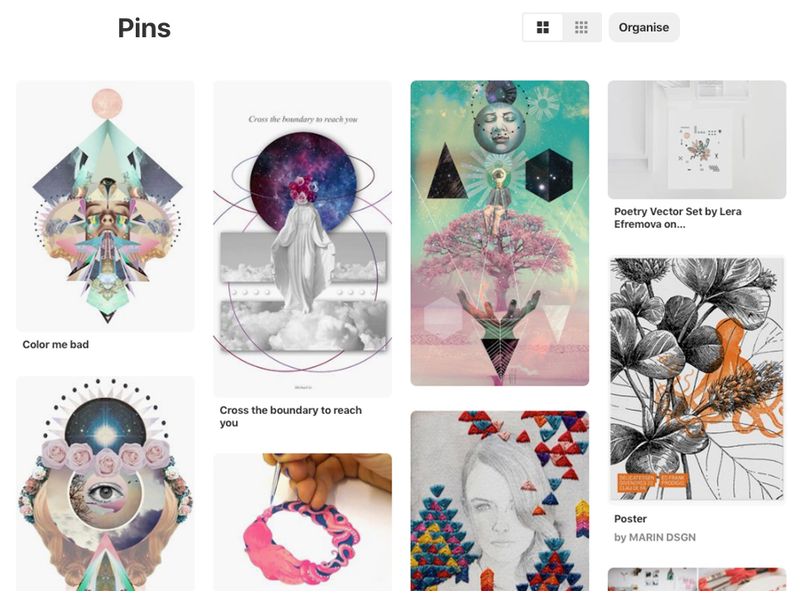 How do you actually, practically put together a Pinterest board? Below are some steps to help you create a Pinterest account and begin pinning to a board! Enjoy! If you don’t already have a Pinterest account, create one in the “sign up” section and fill in your details. If you already have an account you should be directed straight to your account when you go to Pinterest, if not, click “log in” on the top left-hand corner. Click on your profile (this should appear as your name/photo) in the top right-hand corner. Click the “+” sign that sits above your name and select “Create Board” from the dropdown menu that appears. Now you get to name your board! Call it something that makes sense to you so you know what is inside at a glance. If you don’t want just anyone to be able to see this board, toggle “Secret” on. Press “Create” when you’re done. Now it’s time to add “pins” (images) to your board! Imagine you are pinning clippings from a magazine to a pinboard. Head to the “search” bar and type in anything you want to see. I’ve typed in “logo design” as I want to create a board filled with logos. Press “enter” once you’ve typed in your search. Search ideas: “font combinations”, “colour palette”, “brand design” “design trends 2019”, etc. Feel free to get more specific by adding a descriptive word to the beginning of any of these searches ie. modern, clean, professional, retro, rustic, hairdressing, coaching, accounting. Here’s the fun part! Up will pop hundreds (or thousands) of images related to your search. Scroll down the page until you see an image you want to pin to your board. Hover over an image that you like and want to pin to your board. When you do some options will come up. Pinterest will usually suggest the name of the board it thinks you’ll want to pin to along with the “Save” button. If the right board name pops up, just press “save”! If not, select the dropdown menu and either choose the correct board or create a new relevant one. The bottom circle shows the source of the image (what website it comes from). This can be useful to click on if you want more information on the graphic. This is an optional step for if you’d like to add any notes/caption to the image. After you have pressed “save” a little pencil icon will appear. If you click on this you have the chance to edit the pin. You can change the description, board or section. Repeat the above steps 5-8 until you have filled your board to your satisfaction. To locate your full board, just click on your profile again and select the board you’d like to view. It should have in it all the images you’ve just pinned! 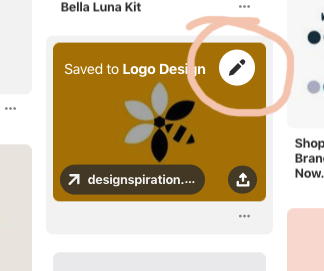 If you’d like to share this board with your designer so they can see what you’ve pinned, simply press “invite” (which is next to your profile picture when you are in your profile). There are TWO ways to share your board. 2. Search their email address and press “invite” (whoever you invite will have the permission now to add images too). And you’re done!! This board is live, so you can keep adding to it as much as you like and anyone you’ve sent the link to or invited to join you will be able to see it too. Goodluck! And have fun! Pinterest is a great way to explore and to generate ideas and inspiration.